Encourage sales with engaging visuals, mobile-optimized designs, and other captivating content to create magnetism between your business and your customer base. Encourage sales with engaging visuals, mobile-optimized designs, and other captivating content that creates magnetism between your business and your customer base. Your online storefront is the true face of your business. As a primary source of revenue, your website demands a user experience design that’s mesmerizing, highly functional, and above all, created with the customer in mind. Collaborate with the Redstage design team to create a high-converting, attractive online store. With an extensive background in conversion strategy, our web designers can create a beautiful look and feel that inspires sales. Responsive design is a must, especially for millennials who now make up the majority of the US workforce. 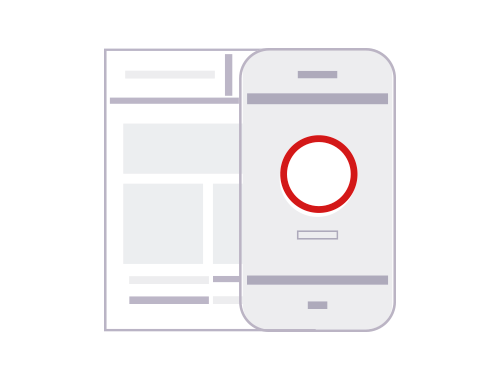 Optimize your site with mobile in mind to look beautiful on any device for the next-generation of customers. Over the past decade, Redstage has become a global leader in ecommerce design. Collaborate with our highly-skilled creators to craft a site that’s visually stunning and fully optimized. Are you looking for guidance or have some design ideas of your own? Collaborate with us to bring your site from concept to completion. Drive sales by optimizing your site for any device or screen size. Our team will work with you to make your current site fully-responsive and ensure your customers can shop how they want, from anywhere. If it’s time for a change, we get it. Whether you’re revealing your brand to the online world or just stepping up your game, a logo change is a big step. Work with our team of seasoned design experts to create an original logo that looks great across devices. Found a new theme or pre-made layout for your site but it needs a little work? We’ll help you implement and optimize your chosen theme for maximum impact. Redstage’s design team knows a cohesive brand image is everything. Get the attention you deserve from our dedicated, knowledgable design staff to transform the way the world sees your business. Want to add some flare to your site? Our creators are at your service. Upgrade your site with new visuals, banners, graphics and product imagery that matches your existing brand. Full transformation means optimizing every customer touch-point. Enhance your transactional emails with a branded design that customers are happy to see in their inbox.